Put your hand on your throat. Now move it down to the top of your chest. You should feel a little dip of bone, like a cup. This is called the suprasternal notch or the jugular notch. It is the top part of the sternum bone. Because of the many important structures running near or behind it, it is a common target in martial arts, for example in jujitsu. Check out this fight scene from the first Matrix movie, at 1:27 the agent throws a suprasternal finger strike. Anyway, the manubrium (Latin for 'handle') is the large part beneath it and then it connects to the body of the sternum at the sternal angle. 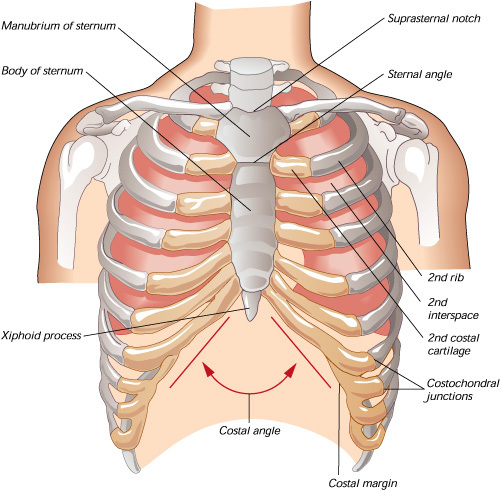 The sternal angle is a cartilaginous joint with little movement The manubirum articulates with the clavicles and the first two ribs. All these are important landmarks because as you learn more about the heart, the various nerves, and other internal organs, you will constantly be seeing references to these, so it is helpful to learn them well now instead of having to keep looking them up later. A common question on anatomy tests are what I call ice pick questions and they generally go: if you were to stab someone with an icepick at a certain place, what would you hit and in what order? It requires the student to put together concepts, information, and 3D relationships. 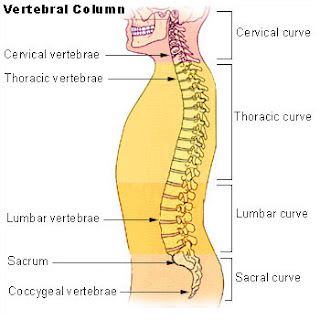 A similar set of questions ask how specific structures are innervated and where those nerves come out of the spinal column, each vertebrae has a letter and a number (Brief Aside: There are 7 cervical vertebrae, called C1-C7, 12 thoracic, T1-T12, 5 lumbar, L1-L5, 5 sacral, S1-S5, and the coccyx, a mass of 5 fused vertebrae). For example the nerve that innervates the muscle called Serratus Anterior is called the Long Thoracic Nerve, and it is a combination of nerves fibers from C5, C6, and C7, I will always list these after the muscle name. If you ice pick someone at the jugular notch, it will come out the back at T2. The Manubrium goes from T2 to T4. The Sternal Angle is at T4 and is about 140 degrees. Origin/Insertion: A good way to think of this is where a muscle starts and ends. But which is which? A good rule to remember is a muscle will generally insert into whatever it is moving. Keep this in mind. About: The pectoralis major, commonly called the pec major, is the large muscle on the chest of males, and underneath the breast in females. It is one of the main muscles used when bench pressing or doing push ups. As explained above, the letter/number referes to where in the spinal cord these nerves originate. I will later go through all these nerves as an entity, it is called the Brachial Plexus, and in any anatomy class you will need to memorize it completely. Why is it important? Say you have a patient with upper shoulder/spinal trauma, if you can figure out which muscle actions do not work, you can figure out which part of the spinal cord might be affected (great test questions). Now lets think through the origins and insertions (O/Is) and see if we can make sense of how they dictate the actions. Muscle fibers only contract, they do not do complicated movements. So if we imagine contraction, it makes sense the the arm will move closer to the body, up, and forward. Boom, that's the 3 actions. I prefer understanding the actions, as opposed to simply memorizing them all, because then you don't have to. If you know O/Is you can figure out actions. And where there is a major there is usually a minor. If a structure has a name with major or minor, anterior or posterior, or superior/inferior, it is a good bet that the other also exists. 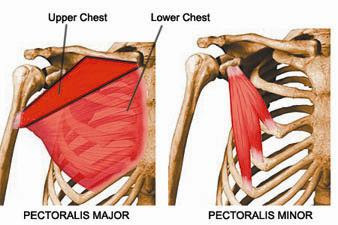 About: Pec minor is the small little brother of pec major. It sits behind, or posterior, to the pec major. 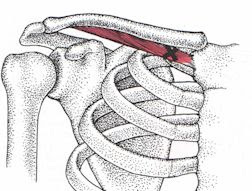 It is smaller and plays less of role in movement and big actions and more of stabilizer role for the scapula. It helps connect the thoracic cage with the scapula. 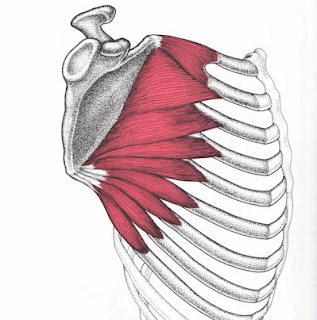 About: Also called 'The Pull Up Muscle', The SA is a big muscle going from the ribs to the scapula. When strongly defined the SA is the main muscle that produce the V shaped torso and is a main muscle used when throwing a punch. Actions: Connects the ribs to the scapula, thus when it fully contracts it pulls the scapula forward, called protraction of the scapula. But it is a big muscle and can contract in parts. The bottom and top halves can contract separately causing the scapula to rotate too, though this is not a major function and thus not commonly listed (for examination purposes). It also helps stabilize the scapula. BIG NOTE and clinical correlation: Winged Scapula. If the scapula is protruding from the back, giving it a winged appearance, it is commonly the result of a weak serratus anterior muscle or nerve problem. If someone is really weak, cannot do one push up, and tries, you might see the scapula wing out from simple SA weakness. Common test question: A patient comes in from car accident and has sustained lacerations under his arm pit. You notice his scapulae protruding on the right with a winged appearance. What nerve has been severed? About: This is the first of some muscles that I will be blogging about that are simply not very useful. It goes from the ribs to the clavicle. It is always funny to make fun of someone and call them useless using anatomy. Karen: "Jon why do you never help with are lab group dissections. Stop messing around." Alex: "Jon is subclavius of our group." Jon: "Wow low blow guys." Actions: Not much, helps in respiration. I am currently earning my D.D.S. and after completing my first year, wished better anatomy studying resources existed online (and for free), geared toward the graduate student in an easy to follow and comprehensive format. Most of the content is not original, I am merely trying to provide a central location for the work of many more qualified individuals.